How to Downgrade iOS 9.3 to iOS 9.2.1 / 9.1 for jailbreak purpose. 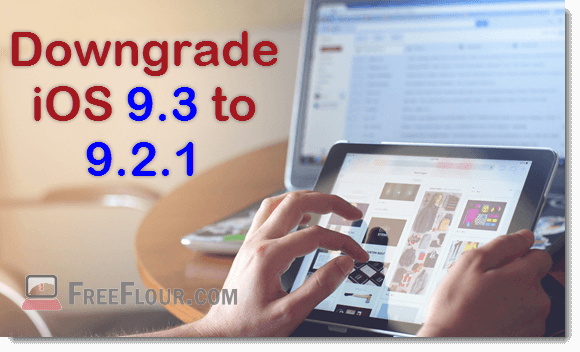 Important things about downgrade iOS 9.3.1 to 9.1 with iTunes Error 3194. Looking to downgrade iOS 9.3 to iOS 9.2.1 to secure a jailbreak? Is it even possible to still downgrade iOS 9.3 to iOS 9.1 now for recent Pangu 9.1 jailbreak releases? iOS 9.3 was released not long ago after 6 beta releases. It offers quite an amount of new features and improvements. Well, if you wanted a jailbreak badly, we wouldn’t advise you to upgrade to it just yet if you want to make sure you don’t miss out the opportunity when iOS 9.2.1 jailbreak is released in the near future (for iPhone 6s, 6, 6s and 6 Plus, iPhone 5s, 5c, 5, iPhone 4s, iPhone SE, iPad air 1, 2, iPad Pro, iPad mini 1, 2, 3, 4, all iPad models except the first generation, and iPod Touch 5th and 6th generation). Although iOS 9.2.1 has been on the run since many months ago, developers are still looking very hard for an exploit and we believe the jailbreak is on its way since iOS 9.1 was successfully untethered jailbroken recently. Since the beginning of iOS, Apple implemented this little system about iOS signing through iTunes every time a user restore or update to an iOS version. Apple has to sign the iOS version before you can proceed restoring your device on iTunes. This is why internet connection is required when you restore your device. That said, if Apple decided to stop signing for a version of iOS, say iOS 9.2.1, you will no longer be able to downgrade to iOS 9.2.1 anymore. It’s simply impossible once Apple stops signing for it. This is how Apple forces their users into using what they want you to use. Jailbreak is always not a good business for them. So, in order to secure a jailbreak that might come in the near future, you will have to have that iOS running on your device. In this case, it’s recommended that you stick with your current iOS 9.2.1 if you want to jailbreak your device because iOS 9.2.1 is the closest possible next jailbreak release. Please read the updates at the end of the post before you begin. At the date this post was written, Apple is still signing for iOS 9.2.1. Once they stop signing for it, don’t proceed with the steps below. Step 1 – Download iOS 9.2.1 IPSW file that matches your iOS device model. Step 2 – On your iPhone or iPad, go to Settings, iCloud, Find My iPhone. Disable it. This is important to make sure nothing will interfere the restoration process. Step 3 – Connect your device to your Windows (Windows 10/8/7) PC or Mac with the latest iTunes installed. Step 4 – Open up iTunes on your computer. Backup your device by syncing all your data, photos, videos, etc. Step 5 – Select your device in iTunes. In the summary tab, hold shift and then left click on the Restore iPhone button (for Mac, Option/Alt key). A window will pop up. Browse to the iOS 9.2.1 IPSW file you have downloaded earlier. Select the file and the restoration will begin automatically. Once completed, the connected device will reboot with a clean version of iOS 9.2.1. Downgrade iOS 9.3 to iOS 9.1? In case if you wonder downgrading iOS 9.3.1 / 9.3 to iOS 9.1 is still possible, no it’s no longer possible. Like we have explained before about how Apple signing for iOS before a user can install the particular iOS version, Apple has stopped signing for iOS 9.1 very long time ago. Although iOS 9.1 jailbreak was released just recently, there is no way you can jailbreak your device if it’s not running iOS 9.1 now. People who patiently waited for the jailbreak while holding onto such an old iOS version finally got their reward and now they can jailbreak their device with the latest Pangu9 jailbreak tool. We will keep you informed in this post when a new Jailbreak is released. Follow us on Facebook to be updated with all the latest iOS news and iOS 9.3 jailbreak status updates. Update 1: iOS 9.3.1 download has just been released to fix a major bug related to screen hang and unresponsive. If you have yet to downgrade to iOS 9.2.1 and are looking to do so, do it now or Apple will stop signing for it very soon after. Update 2: Apple has officially stopped signing for iOS 9.2.1. Downgrading iOS 9.3.1 or iOS 9.3 to iOS 9.2.1 is no longer possible. For those who missed out the opportunity to downgrade, you might as well upgrade your iOS 9.3 to iOS 9.3.1 for the bug fix.